Sweet Potato & Lime on Your Chip? Basically, I’m beginning to think that sweet potato is like chocolate….. there seems to be very little that does not benefit from the addition of sweet potato. I try to always keep some on hand because in and of themselves they are a great addition to any meal as a simple side (or with the addition of some walnuts a breakfast!). 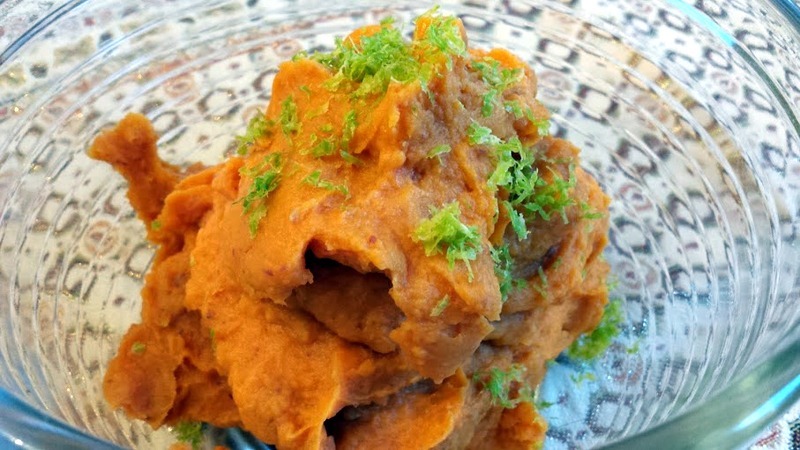 Pop a sweet potato (or 4) in the oven if you have time, or the microwave if you don’t and 4 – 40 minutes later you have a delicious and healthy side that is even better with a little cinnamon sprinkled, a little coconut oil drizzled, a little salt scattered, yum. One appreciates such simplicity when life is complicated by school and work and, well, life. As a result of all the complications, lately I have not been very adventurous in creating whole new entrees. 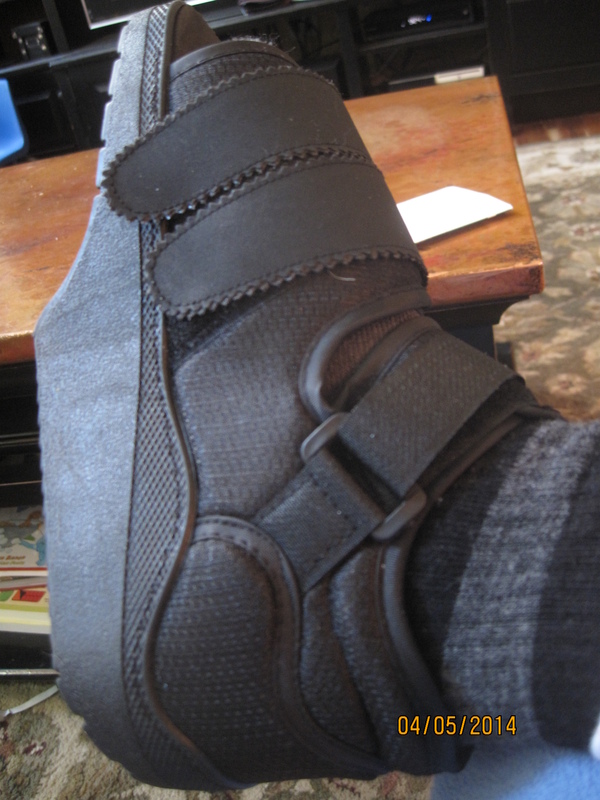 (Or in posting – thank you Little Sis for picking up the slack!). I hate receiving an unenthusiastic, “Oh,” or “Again?” when I answer queries about dinner. 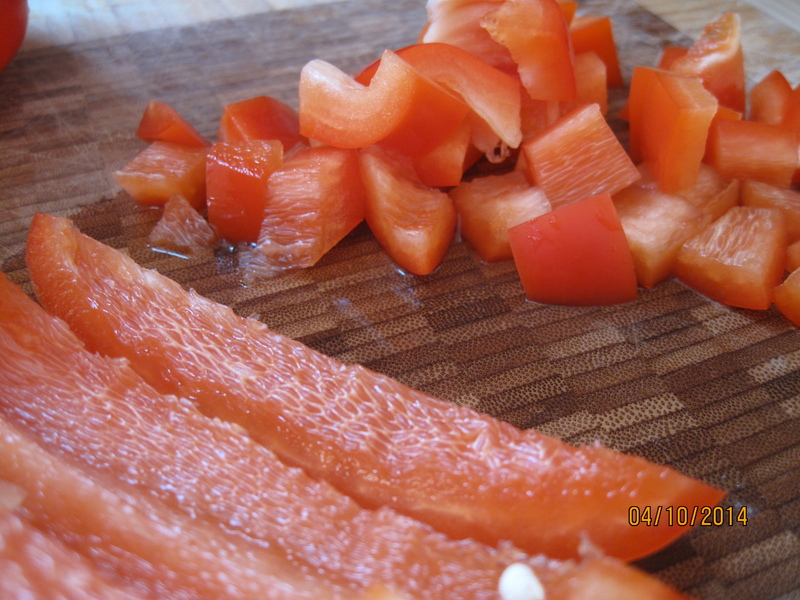 But I have found that a great way to inspire new combos when I am uninspired is to try a new sauce or dip. Pour or spread something flavorful on old standbys and suddenly it’s like a whole new thing. I think dips are particularly nice because they also fill the bill with veggies or Ezekiel bread as a snack, or as a way to make a sandwich very special. 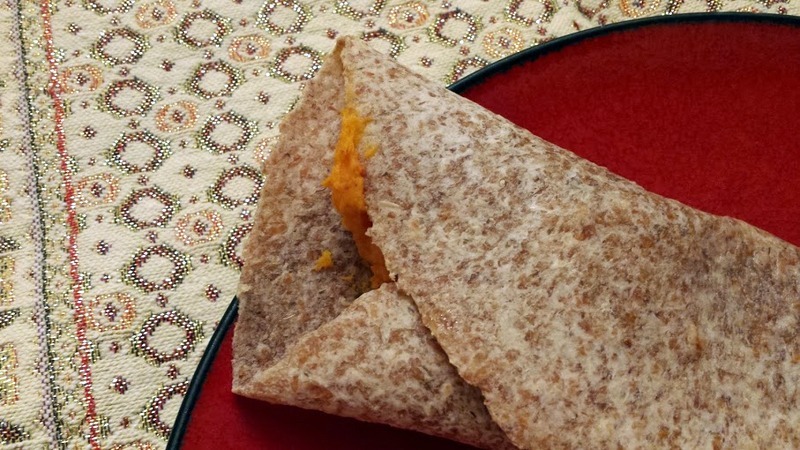 Combine this idea with my love of sweet potatoes and I could not pass up this recipe that I found in an old issue of Vegetarian Times (I’m a little behind in my non-school reading!!). 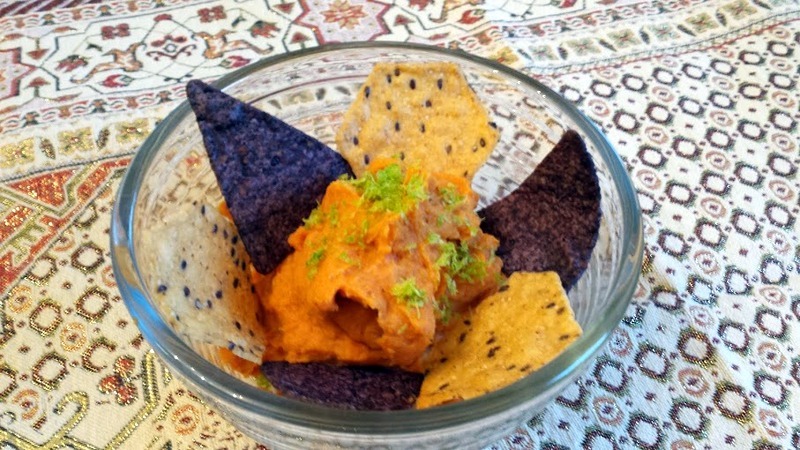 This sweet potato dip is rounded out in terms of flavor, consistency and protein content with some white miso and in terms of flavor with lime and ginger. Simple, delicious and it was scooped onto tortilla chips and added to a tortilla with cheese and salsa in it’s debut in our household. 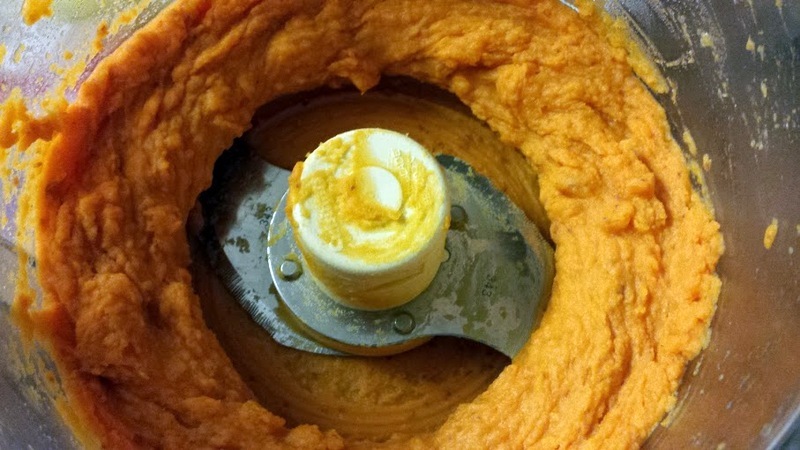 Cook the sweet potatoes until very soft. Add the other ingredients and process until smooth. You may have to add a little water – I added about 2 teaspoons – to desired consistency. Then dip, spread, slather and put it anywhere that might change the “Oh,” or “Again?” into, “That sounds interesting,” and eventually, “I like this!” My son ate his in a tortilla with cheese and salsa. I was thinking the addition of some black beans (just open a can on a busy night!) would have been perfect. Mr Bigg Sis and I complemented the last of the leftover chicken soup with the dip and chips. Really made those last 2 bowls of chicken soup more interesting! If you would like to try some dips or sauces to easily add interest to the same old same old…. Here are some more to try! Happy Dipping and Spreading my friends! 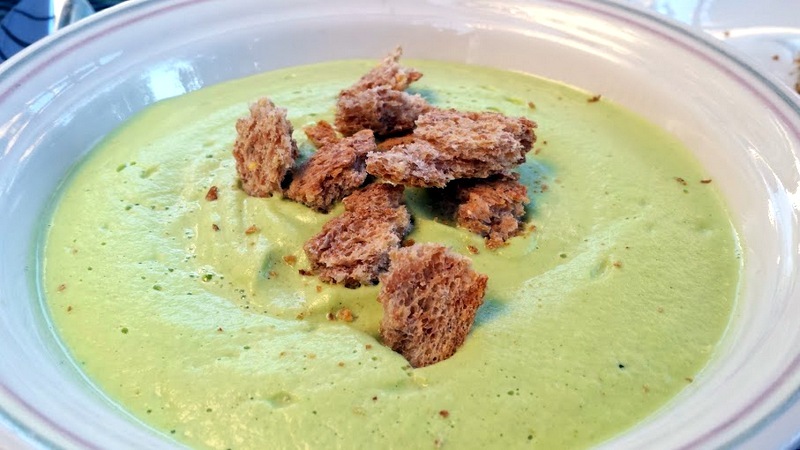 One of the most wonderful things about a powerful blender is the creamy soup that can be created and poured… or schmoved with a spatula into bowls – already hot! If your blender isn’t strong enough to heat, then you can always pour this into a pot and heat after you’ve creamed it. There is nothing like soup to fill the belly and warm the soul. We experimented with a lot of soups when we first bought a Vita Mix (15 years old and still going strong). One of our favorites was Broccoli Cheese Soup. What’s not to like about Broccoli Cheese Soup? 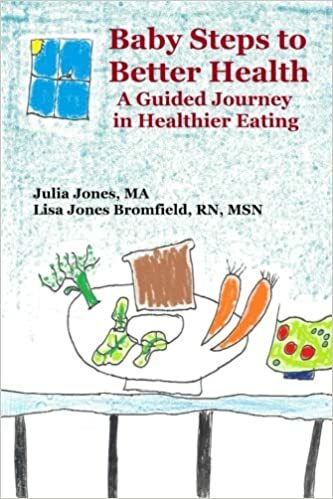 Well, once you determine that you can’t handle dairy, and there are those that argue that the fat in dairy is a bad choice, and those that would rather leave the cow’s milk to the cow’s…. well then, the cheese is not to like about broccoli cheese soup. So here is my dairy free version, loosely based on the recipe for broccoli cheese soup found in the Vita Mix recipe book. You can also substitute broth for water – or broth for water and milk. Whatever works for you! Steam or blanch your broccoli – keeping in mind that stemmy pieces need a little more cooking than plain florets. Put all ingredients in the blender and whirrrrr it up, or more accurately, sideways until it is smooth and blended and if you don’t want to heat in a pot – let it spin till it’s hot! This took 20 minutes from the beginning of chopping onion to pouring in the bowls. You gotta love that! Enjoy the arrival of Fall – may your windows be open, your skies blue and your hearts full like a pumpkin. I have cucumbers coming out of my ears – and no Big Brothers, I did not eat a seed. I can only assume that our relatively cool Maryland summer has delayed the usual onset of powdery mildew (which has now arrived and I’m combatting according to Big Sis’ suggestion) long enough for my cucumber plants to go bananas, so to speak. I’ve regularly been harvesting not just 1 or 2, but anywhere from 6 to 16 (yes, I said 16) delicious cukes from my 4 cucumber plants. What variety is doing so well in my not very well tended garden? I have no idea. Seed mixups are a real bummer. I digress. In order to take advantage of my cuke bounty, we’ve been experimenting with some things, and I’ll share more of them over the next few weeks before it snows and puts an end to this whole summer bounty thing. Today, while it is relatively hot, I’ll share a lovely cooling use for all those wonderful cukes. Peel and seed the cucumbers – dice 1/3 of them (or one pound) and set aside for the relish. While I often recommend skipping peeling and such, in this case I peeled to remove the bitterness sometimes in the skins. Coarsely chop remaining cukes and place in blender with the rest of the ingredients for the soup. Blitz until smooth. Place in fridge to chill. Yes, that’s it. No, I’m not joking. 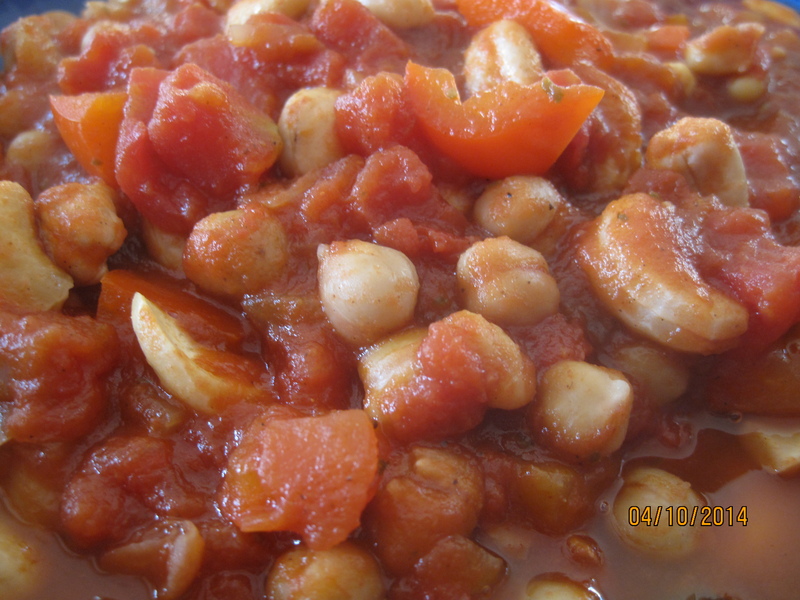 Just before serving, combine ingredients for relish in bowl and stir. Done. No muss, no fuss, no cucumbers wasted. Delish. Happy super late summer! Little Sis and I often preach about leftovers to the choir…., I mean for the choir…. I mean leftovers for breakfast or lunch or part of dinner. If you always make extra there will always be something (homemade and healthy) to eat, right? If you are having rice twice in one week, make enough for both meals, plus a little because you can always toss in some raisins, nuts and milk and eat it for breakfast, or throw on some fresh or frozen veggies or meat or pasta sauce, without having to cook rice again. This can be a real time saver when using brown rice….. if you’re not using it give it a try – it is so much better for you. However, and at any rate, lots of leftovers in the frig can drive us into a rut as to how we use all of the leftover bounty. Here is a fast solution to the leftover veggies, grains and meat in your frig which you can use for a planned or unplanned meal. 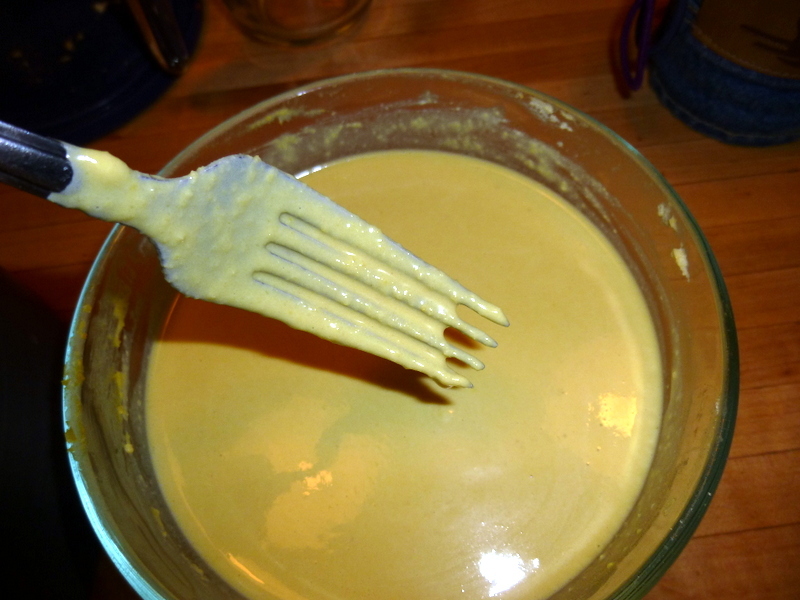 Here is my Fast & Delicious Lemony Hummus Sauce. Pretty fast and simple, right? Now, your consistency will vary depending on the consistency of the hummus you start with, thus some choice in water amount. Add some water and see what you think. How lemon-y you come out will also have to do with what you start with. My hummus had a little lemon in it already, so if yours does not you may want to add a little more. Additional lemon juice will also thin the consistency. What’s for dinner? If you don’t have much time and there are some leftovers in the frig and some hummus you are all set. 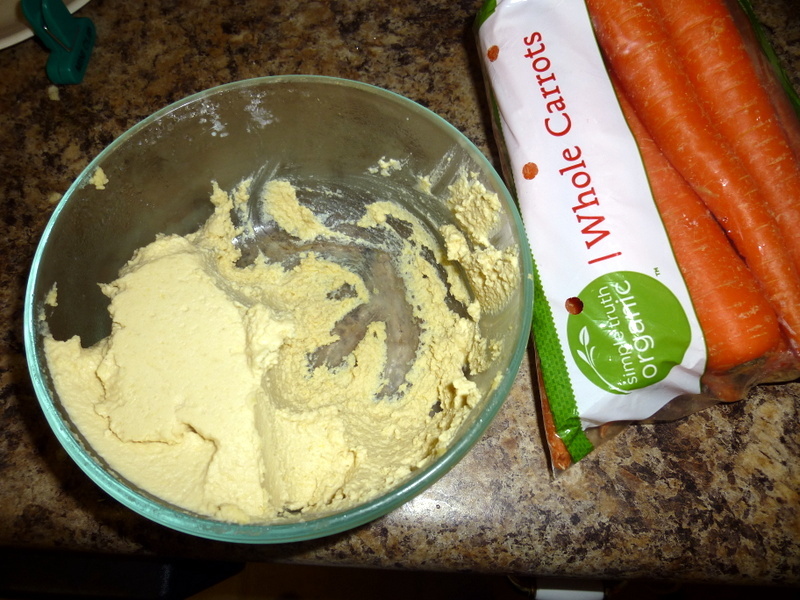 If you’ve never made hummus before, it’s not hard and so much cheaper than what you buy at the store. Little Sis is the queen of hummus and has offered up Navy Bean Herb Hummus, Baja Hummus and Garbanzorange Hummus, in the past. Try them or use up that tub you’ve got in the frig first. I am frequently reminded (in documentaries about other places that my son loves) that much of the rest of the world actually eats a breakfast that looks a lot like the other meals of the day – some kind of grain and some veggies, maybe a little protein, maybe not. And yet these sweet loving taste buds lead so many of us to constantly seek out a breakfast that does a great job in satisfying a sweet tooth, but doesn’t necessarily do much else. Despite all my sugar busting, I confess that my own flavor preferences in the morning tend toward the sweet side of the spectrum. While on the morning in question, I wasn’t necessarily interested in simply having leftovers for breakfast (although this is an entirely reasonable proposition), it occurred to me that I had no good reason for not including vegetables in my morning repast. 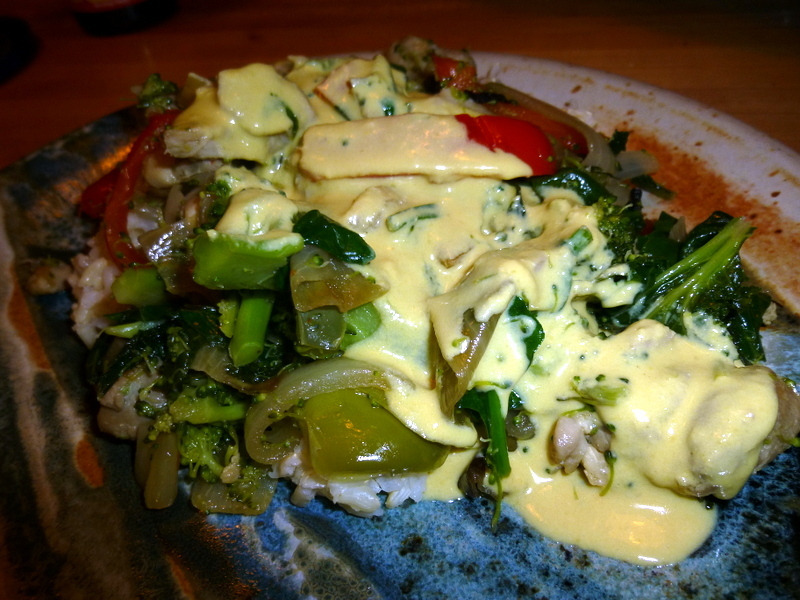 Vegetables CAN be in a dish that’s not primarily savory. I took my lead from my sister (yet again 😉 ) and just turned up the volume. The result? 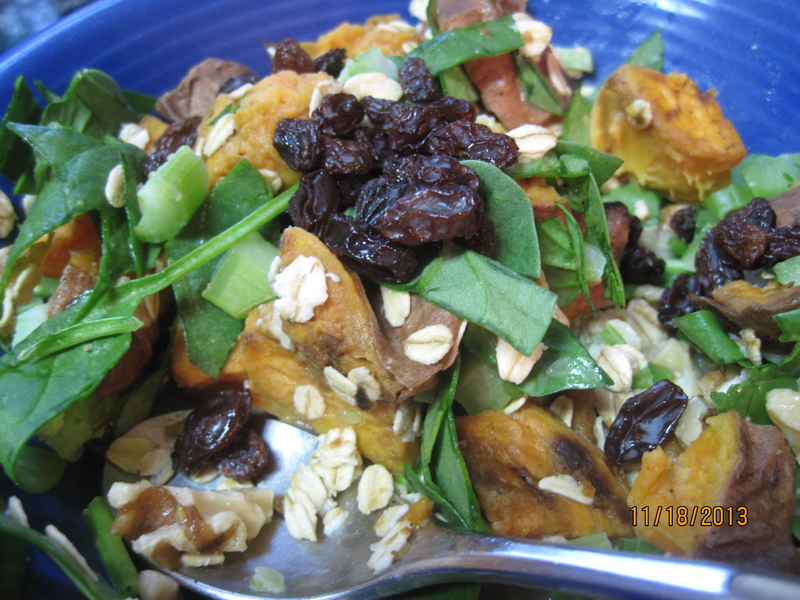 Very slightly sweet, super satisfying, nutritionally superb and a definite keeper. I thought the celery and greens would interfere, but truth is they were absolutely delightful. 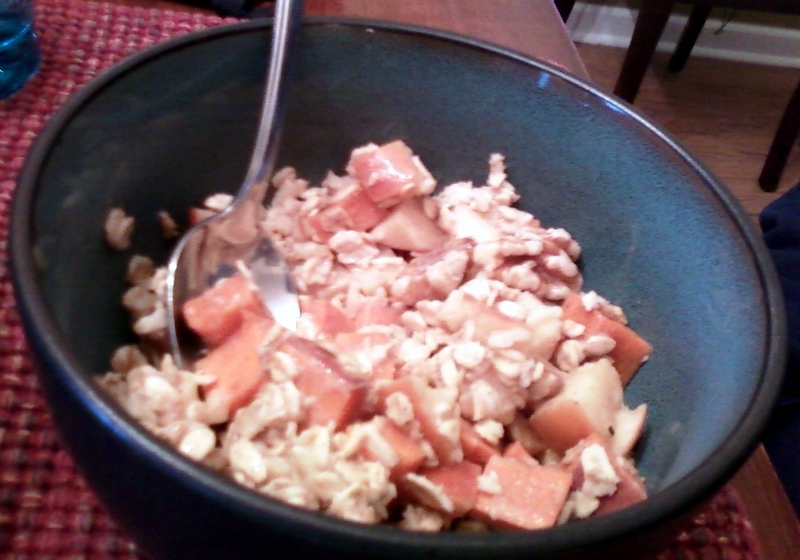 And I don’t care who you are, there is absolutely NOTHING wrong with sweet potatoes for breakfast. Okay, so I haven’t shaken the sweet tooth just yet, but things are definitely looking up. Throw some greens in there – you just might be surprised. Delish! We finally made it through the fall crud. This tenacious little virus swept its way through all four of us, Mr. Little Sis being the final victim. I was long done with soup, but he still needed a little respiratory assistance. Mr. Little Sis’ favorite form of respiratory assistance is spicy. And so, I whipped up some lunch (to avoid sharing with the ungrateful spicy-hating children) to give him a leg up. 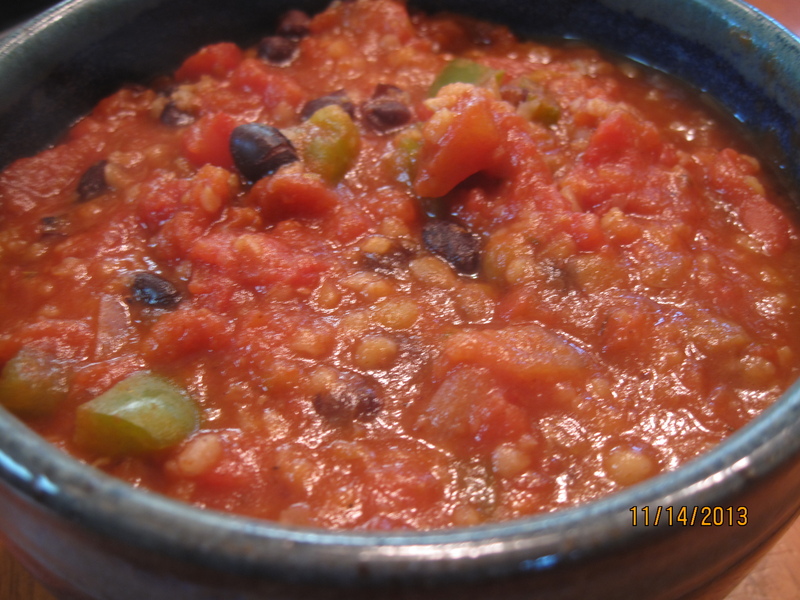 30 minute bean and bulgur chili made a quick, spicy, and satisfying lunch for both of us. Bean and bulgur you say? Those who’ve been playing along with us for a while will be familiar with the bean and bulgur combo, but if you’re new, check out this earlier post. The short version is that beans and bulgur together make a cheap, easy, and tasty substitute in a lot of recipes that traditionally use ground meat. I’ve found that making up a batch of bean and bulgur allows me to use it in a couple of dishes in the same week with tasty and speedy results. This chili was the second bean and bulgur dish of the week, after these burgers, so admittedly the 30 minutes does not include cooking the lentils and bulgur. 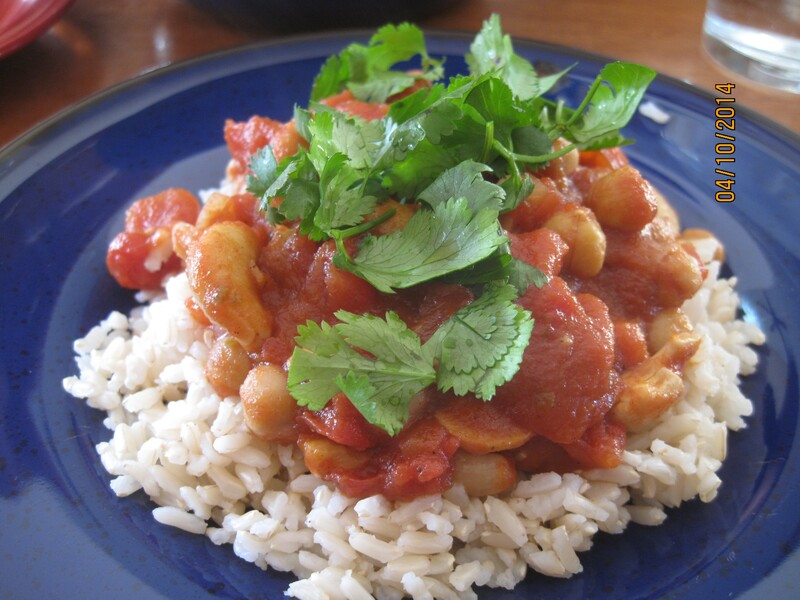 You could, however, use any bean and grain combo successfully – leftover rice and canned pintos? Great! This recipe is very forgiving and you should, as always, feel free to tweak according to your preferences and the ingredients you have on hand. Warm olive oil in skillet over medium. 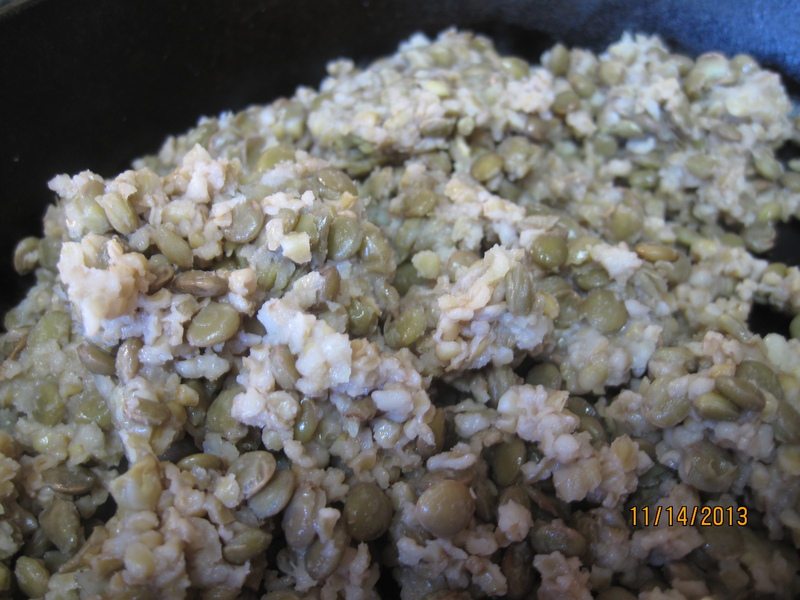 Add lentil bulgur mixture to skillet and LET IT SIT. You are going for a little browning and crisping here. If you stir too much, you will get neither. Check after you’ve given it a few minutes, add sage and 1/4 t salt to lentil/bulgur, then stir/flip to brown the other sides. Warm olive oil in large pot. 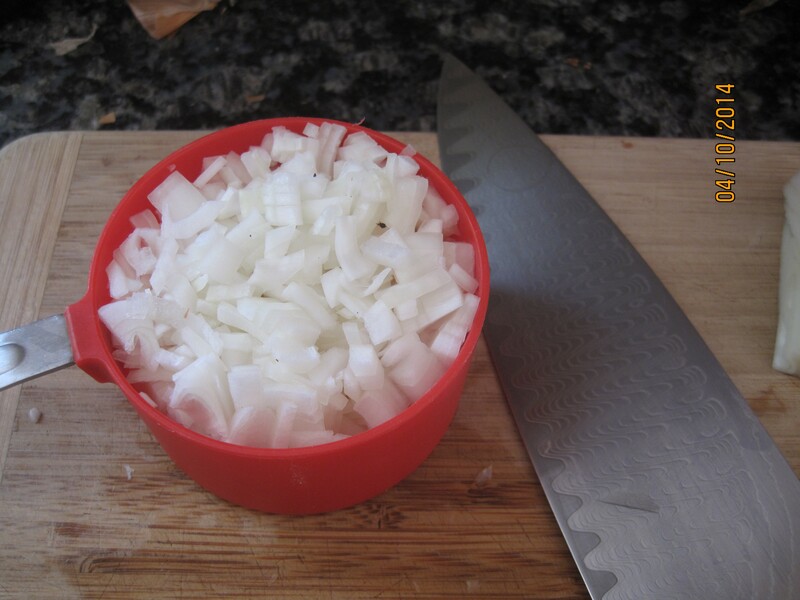 Add chopped onions and saute until onions have softened and become a bit translucent. Add garlic and cook until fragrant. Add green peppers. When lentil/bulgur mix is browned to your liking, transfer to pot with onions/peppers. Add spices and diced tomatoes. Stir to incorporate. 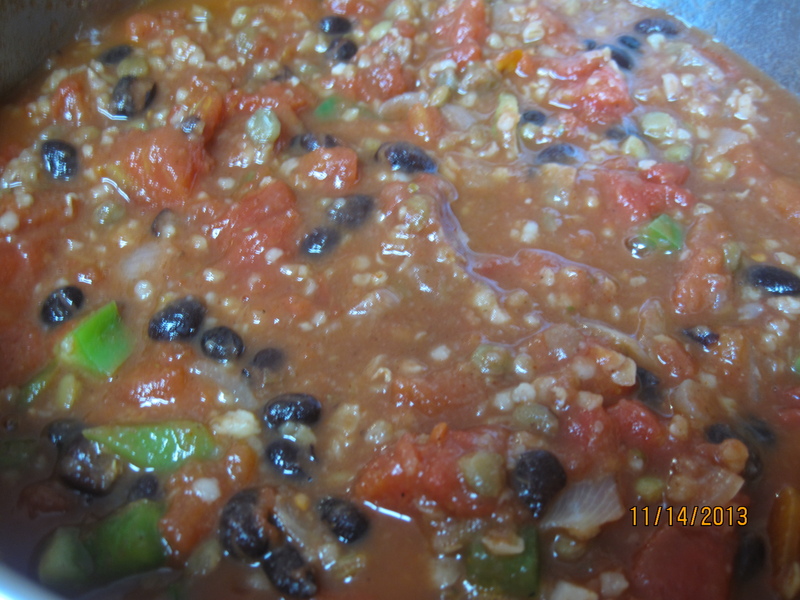 Bring to simmer and let cook to meld flavors, about 15-20 minutes. 30 minute bean and bulgur chili. Done and delish! It is a constant challenge to introduce vegetables to the breakfast table. It is in the US anyhow… I’m sure there are places where veggies are more regularly eaten as part of breakfast but it is a struggle here. I partially solve the problem with smoothies – throw some fruits and veggies in with milk or vegetable juice, hit the button and my child has actually eaten kale before 7 in the morning. But I do like to find other ways to increase the intake of produce in the morning without relying solely on fruit. One recent morning (when my good camera was not working, nor was my planning) I looked in the pantry and saw 2 sweet potatoes. They were close but not touching, clearly having a little trouble getting along and both of them wanted to transform their molecular energy into a new form…. perhaps new cells for my ailing brain? So I chopped them up fairly small. chopped up a big apple, and nuked the whole lot of red, orange and yellow bits until getting soft. Although I am dimly aware (especially on the particular morning in question) of objections to microwaving food, I have to say that getting more veggies down the hatch seems to me to over-ride them. I could be wrong, but I’m sticking to my Veggie-ful approach, and sometimes it needs a little help!! Okay so now I have sweet potato and apple. Where to go from here? Well, after my son reported to the neighbor who gave him a ride to school one morning that he had a big bowl of nuts and seeds for breakfast, I decided we would forego the neighborhood report on the big bowl of potato and apple and add some morning normalcy…..
Nuke for a minute and then stir again. You can stop and eat this now if you like crunchier / more raw oats or you can nuke it again, but don’t go more than a minute at a time – or even 45 seconds til you see how your microwave does so that it doesn’t boil over the top. You can also add more milk or water if you want your oats softer. Add any optional delights! I encourage you to taste before sweetening as the cinnamon and apple might just do it for you! If you’d like to try some truly soaked oats (no cooking – throw it together at night, ready in the morning) check this out! And if you’d rather not nuke the veggies you could cook them the old fashioned way the night before and mix in with soaked oats, or pot cooked oats in the morning. But if you forget – don’t have time, whatever….. you can resort to the nuclear incident. Here’s my one lame picture from the phone. I was very pleased with this concoction and we will have it many times in the future. It is much faster than some other hot cereals I make PLUS it has a glorious vegetable making it’s way down the gullet prior to 7am…. on weekdays that is.